I have a huge Halloween party that I go to every year and each year I try to come up with something better than the last… This year I was the star from the movie “Big”…Zoltar! 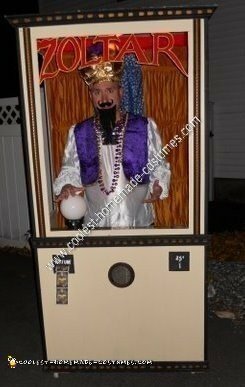 I came up with the homemade Zoltar Halloween costume idea over the summer but with the help of my father it was created within a month. First we took a trip to Lowes and bought all the materials including the lumber, moldings, screws and the dome shaped glass light cover that I used as my crystal ball. Then we began to assemble the booth. The booth was made from a quarter inch plywood. We measured me and cut the front and sides of the booth beginning at my waist area. We also cut out the back of the booth and made a door with hinges so I could come and go as needed. Then we painted the booth itself a cream color. We then added crown molding trim to the sides and top of the booth which we later painted and added designs to give it a fancy look. My father then made both the “quarter slot” and “fortune slot” out of pine wood. The quarter slot even had a coin catcher attached to it in case anyone decided to drop coins in. Zoltar’s speaker was an actual old speaker cover that we found in our house. We then attached four little swivel wheels to each corner on the bottom of the booth so I could walk and roll around in it. Next we needed a back ground for the booth. The brownish curtains were some old curtains my mother had and the blue material with stars on it came from a local fabric store. We stapled those to the booth using a staple gun. The base of the crystal ball was made out of wood and a piece of plastic. We painted it and then glued some green gems around it for a fancy look. The night of the party I placed a battery operated candle under the glass ball to give my crystal ball a glowing effect. Both my Zoltar fortune cards and tarot cards were downloaded photos I found on the computer and printed out. They were laminated and glued to the booth so they wouldn’t get ripped or ruined. The final step and perhaps the most difficult one was deciding how to get the Zoltar logo on the front of the booth. We were going to get plexi-glass and paint the logo on like the original Zoltar machine. However, since I was going to a party and did not want to be closed in so I couldn’t talk to people we needed to come up with something else. My father came up with the idea of cutting the Zoltar logo out of quarter inch plywood, painting it and attaching it to the top inside part of the booth. With the booth complete all that was left was the Zoltar costume itself. I went to a couple of Halloween stores where I found my shirt, vest, hat, beads and mustache. I was able to make a pointed beard out of an old beard from a past costume. I attached the beard and mustache with two sided tape (spirit gum did not work). the BEST i’ve ever seen…GREAT JOB!! Terrific! I hope you win!